Vinny Perth's side were considerably below par at Richmond Park, with a comical own goal from Daniel Cleary downing the champions. It's the form of Shamrock Rovers that is leaving minimal margin for errors of that nature. Their sloppiness shouldn't take away from a morale boosting success from Harry Kenny's Saints. 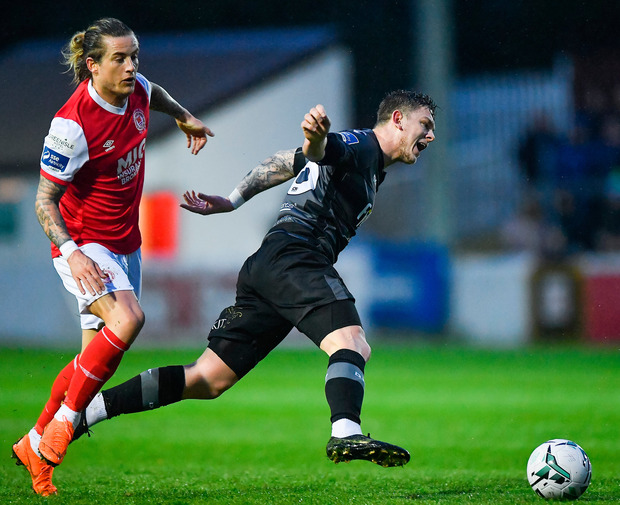 The early season optimism around Inchicore had drained away in recent weeks and there was a distinct absence of any buzz around the ground beforehand. At full time, the natives were in good voice again - albeit a bit relieved after an injury time miss from Pat Hoban - and the hope will be that this result will bring back those fans that chose to stay indoors on this muddy evening. Pessimism was understandable, seeing as Mikey Drennan - who remains the only player to score a league goal for the hosts this term - out through suspension. Kenny returned to the three at the back which was his preferred strategy at the start of the season, with lone striker Gary Shaw relying on the support of Chris Forrester, Conor Clifford and Rhys McCabe if he was going to be effective. It made for a congested midfield battle in the driving rain. Dundalk withstood some early pressure, while trying to break into space behind the Saints' wing backs. Daniel Kelly missed a clearcut opportunity to break the deadlock after a rapid counter. The Saints began to get on top as the interval approached, with the Dundalk bench frustrated as their midfield three - Sean Hoare, Sean Murray and Jamie McGrath - were overwhelmed by the opposition. With the rain falling, the Saints were showing a bit more energy and the attack-minded Murray and McGrath were pressed out of their comfort zone. Yet the breakthrough goal that gave the Saints an interval lead really did come out of nothing. McCabe did make a good run across the pitch to the left flank but his cross into the area should have posed no problems. However, Dundalk centre half Cleary inexplicably turned the ball into his own net under no pressure with Gary Rogers on hand to collect. Even a communication breakdown couldn't adequately explain the outcome. After taking just two points from their last five league games, and failing to score in the last three, this may just be the break the Saints needed to escape from their rut. 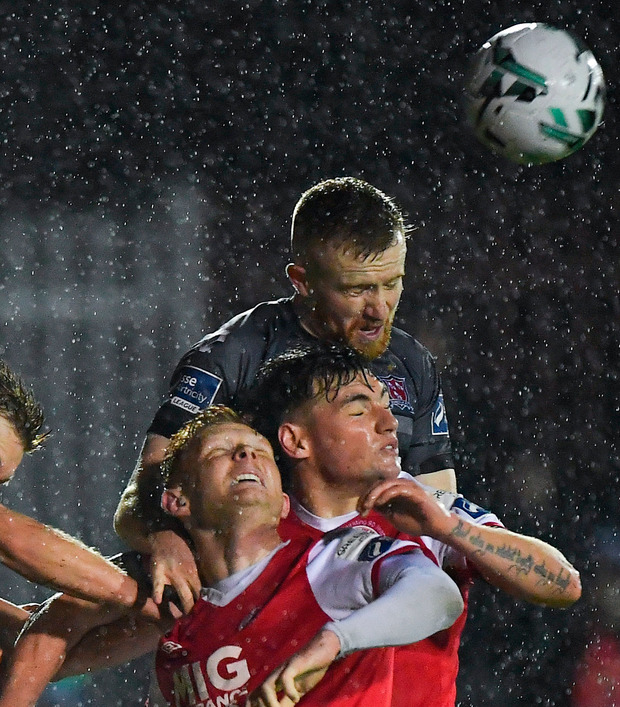 It gave them something to protect and they were disciplined from the resumption, allowing Dundalk's frustration to grow. The lilywhites did have plenty of the ball but Hoban was finding it hard to get into the right areas, and Michael Duffy was marshalled well by Dave Webster. The Saints actually squandered an opportunity to put the outcome beyond doubt with Forrester culpable, and the busy Conor Clifford also threatened on a handful of occasions. That stirred Dundalk to life and they did pile the pressure on in search of a leveller with Murray twice threatening from distance. Sub Georgie Kelly also had a shout from a penalty waved away. 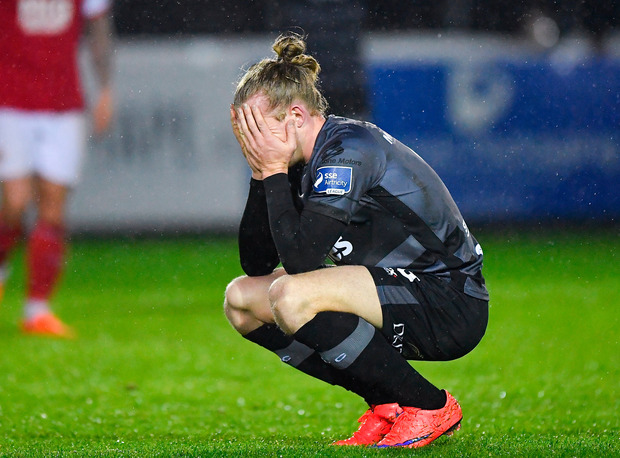 But Dundalk were ultimately penalised for leaving it far too late to come to life.